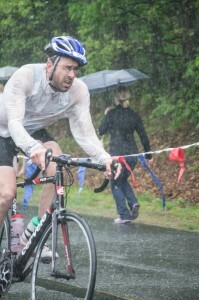 There’s just no getting around it: Today’s NE Season Opener triathlon was wet. After what felt like the longest time away from triathlon—August’s 70.3 was my most recent—I had been looking forward to this race for quite a while. It didn’t occur to me until yesterday evening, when we were watching the weather forecast on TV, that it was possible that we would get rain during the event. But rain it did. Sprinkles at first and then a full downpour during the bike portion. There were rivers running down the highway, and Lisa said there were several crashes on the big hill leading to the transition area. Fortunately, the rain ended right as I started my bike-run transition, and I finished with a time that was just off my best time from last year: 1:09:47. I made a couple of good decisions today. First, I decided to bring Tommy V (my road bike) instead of Chrissie (my tri bike). Over open ground, Chrissie is a couple of miles per hour faster, but I’m a lot smoother and much more agile when out for a ride with Tommy. Given that I could barely see through the rain today and that some of the corners were tight, it was the right choice to pick conservatively. And yet I still was passing lots of people. In fact, my bike split felt good and was the strongest part of the event for me. I started to wonder whether I was pushing too hard given how many people I reeled in, but I had more than enough in the tank for the run. My other good decision was bringing a plastic bag to put my running shoes and socks into to keep them (mostly) dry until I needed them. On the other hand, I should have started farther forward in the swim. Evidently, I got faster over the winter, and I was constantly swimming onto people, slowing my forward progress. I could easily have been about 10% faster if I’d had fewer people elbowing me in the face or slowing down in front of me. On the plus side, I drafted on the swim! That was a first, and it was pretty cool. My diabetes mojo is a bit rusty. I decided to try something different today, so that I could eat a bit more before the event. I was doing pretty well keeping my BGs down until just before the start when it started to go higher. Unfortunately, I went all the way up to 274 mg/dL (15.2 mmol/L) by the finish. Something to work on for next time. This entry was posted in Cycling, Diabetes, I am Rembrandt, Photography, Reluctant Triathlete, Running. Bookmark the permalink. One Response to Swim. Swim. Run. Holy WET! You look absolutely MISERABLE in that bike picture up top! Glad to hear that the event went well for you (except the BG thing, but whatever…)!